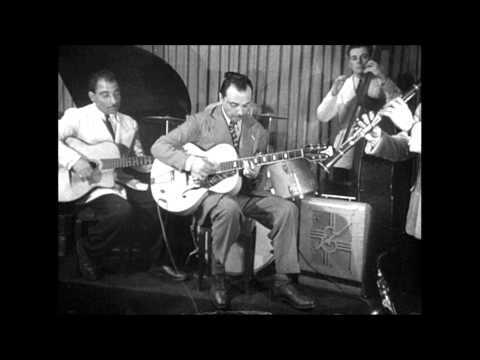 Footage of Django with archtop. A few years ago, I saw a short clip on YouTube of Django playing an electric archtop in a band setting. I haven't been able to find it since. Has anyone else seen this? It was only 20 seconds or so. While I'm at it, has anyone compiled the available/known footage of Django? Where could I find it? That is the clip! Thanks Michael. @"Andrew Ulle" The J'Attendrei clip is the only surviving clip of Django with the original audio. People often add audio the other surviving clips, but it's not original. That makes sense as archtops tend to sound nice when played there. I play an archtop acoustic on occasion and strum way over the fingerboard when playing rhythm. For single note lines, if you're using restrokes and playing quite hard, you can't play too far forward as there isn't enough string tension to handle it so the notes just crap out. But I still play closer to the fingerboard on an archtop than I would on a Gypsy guitar. The evidence suggests that Django struggled with archtops. 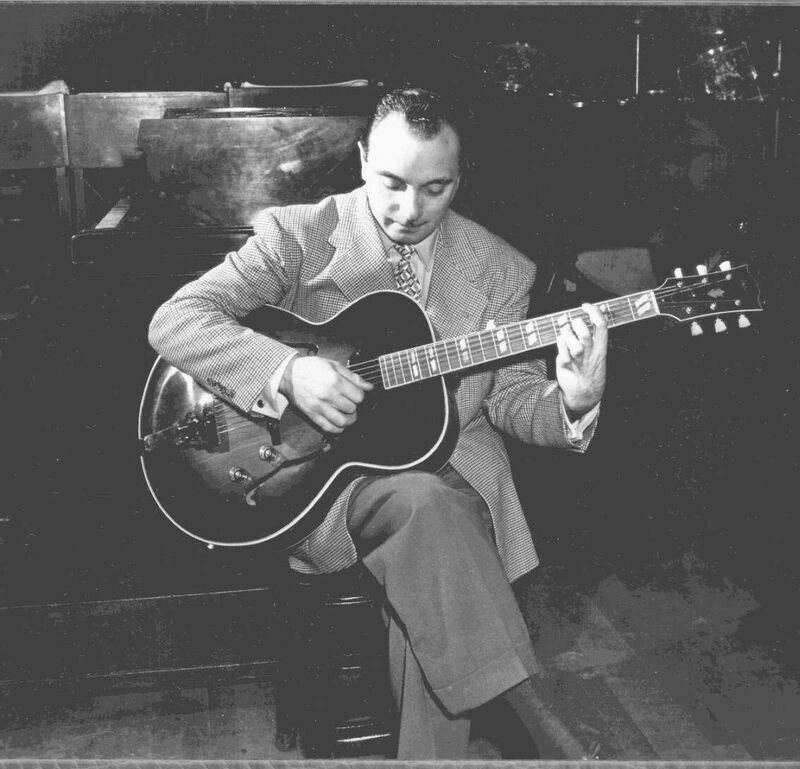 Les Paul once said that Django didn't get on with his arch top on the US tour because he was a 'down picker'. He certainly experimented with them in the late 1940s, but seems to have shifted back to his Selmer when he found he could emulate the sound of an arch top with a Stimer pickup. Many of the late recordings people call 'electric' were probably played on a Selmer. The evidence suggests that Django struggled with archtops. Les Paul once said that Django didn't get on with his arch top on the US tour because he was a 'down picker'. He doesn't sound to be struggling on the recordings we have from the Ellington concerts. Many of the late recordings people call 'electric' were probably played on a Selmer. With one exception, they were all almost certainly on an amplified Selmer. I am sure Django preferred his Selmer with or without amplification but I do not think he struggled with the electric guitar in the way Les Paul has suggested. It would have reflected more in his playing if he had. I think the suggestion that Django started copying him was more in Les Paul's mind than a reality. Django started to assimilate bebop into his playing, not Les Paul. - However, Les Paul was a great friend to Django and later to Naguine.